Plush Palate: Pretty in Pink! I had to post this because the pink, Benjamin Moore's Razzle Dazzle, is just too much fun! The owners must have such a healthy sense of humor. And the more I look at it, the more I like it! What do you think? Yes! The perfect bright pink! I want to paint the inside of my closet this color. OMG. I ADORE that! To absolute pieces! The pic is from this month's House Beautiful. It's from a house full of girls, and almost every room has some shade of pink. Amazing. 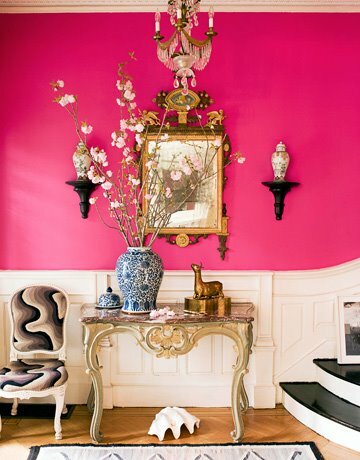 adore this hallway and obsessed with that amazing shade of pink, which is benjamin moore's 'razzle dazzle' -- the image is from the july issue of house beautiful, photography by francesco lagnese -- hope that helps! Ah, I love this wall and the shade of pink is stunning. My dream closet would be this color. Also, I'm loving your blog. Just beautiful. I'll be back.